All forklift tires and industrial tires are not created equal. Different manufacturers utilize different tread compounds and styles to build their tires. Pete's Tire Barns carries high quality forklift tires from all of the major manufacturers. We also carry all different styles of tires for forklifts, aerial lifts, baggage carts and other industrial applications. This includes pneumatic tires, solid tires, pneumatic shaped solid tires and press on band tires. Various tread patterns are available as well as non marking tires and off road tires. No matter who makes the forklift, Pete's Tire Barns online tire store has the forklift or industrial tire that you need. The BKT PL-801 forklift tire is designed for forklift trucks and service on material handling equipment. 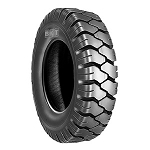 The BKT FL-252 forklift tire is a widewall tire designed for heavy duty forklifts and material handling equipment. The MS601 Industrial Pro tire from Maxam is a smooth press-on band solid forklift tire. The MS601 Industrial Pro features low rolling resistance and natural rubber compounds for energy efficiency and long tire life. The Industrial Pro MS601 tire from Maxam is a smooth press-on band solid forklift tire. The Industrial Pro MS601 features low rolling resistance and natural rubber compounds for energy efficiency and long tire life. The Trelleborg Monarch press-on solid forklift tire was specially engineered for operator comfort, long wear and efficiency. The Trelleborg ORCA solid forklift tire was designed specifically to be a balance of price and performance. The ORCA solid forklift tire was designed for companies needing a tire for a forklift that is not in constant use or that carries smaller loads.